I wasn’t going to write about My Someone this week. Two posts in a row is just too much. Branch out Danielle, don’t be that girl. However, the two blog post story ideas for this week were turkey hunting and chickens calling, both of which involved My Someone. It’s turkey season! Whoop Whoop! 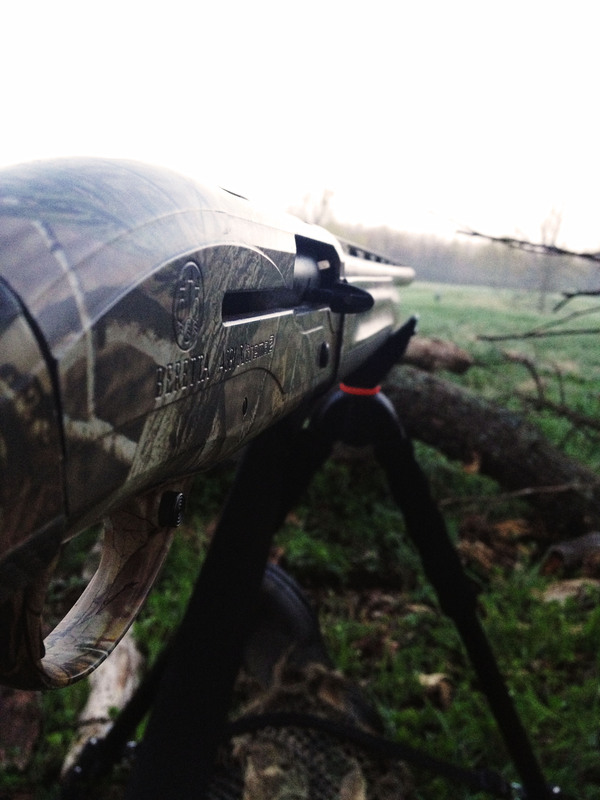 In the past, my experience with turkey season never involved ammunition. I was armed only with camera equipment. I even have the shirt to prove it. My Someone didn’t get that memo. The day before our first hunting-togetherness experience he handed me a shotgun and some shells and proceeded to begin drawing a turkey head on a piece of paper. The title of my blog alone should tell you, this wasn’t my first rodeo with a shotgun, but nevertheless, I was confused as to my sudden promotion in the world of hunting. “You need to be familiar with the gun, this is about you killing your first tom. I’ll take pictures,” he said in response to my confused face. That my friends, are the words to make any redneck girl’s heart go pitter-pat. So outside we went, turkey target taped up to the side of the shed, we took our seats some distance away. A few practice tries and then it was the moment of truth, I loaded the gun and lined ‘er up. My Someone moved the turkey target to a tree, “I’m going to watch your form this time,” he said. Editor’s note: Men are technical. In my world, I shot it, it’s dead. What does it matter how it got from point A to point B? I once again put the sight on the top of the turkey and pulled the trigger. “You took that like a boss!” “Perfect!” He said. I wanted to be like, “yeah, I know.” *pops collar* *dusts off shoulders* but really, I was just thinking the heavens that the stars alined, the wind blew just right and by sheer luck I hit the target both times avoiding the embarrassment of being perceived as prissy. The next morning I was pumped. It didn’t even matter that it was 4:30 a.m. I was finally going to have my own turkey. We got to our spot, sat everything up and waited. Pretty good start to a day, if I say so myself. An hour of sitting on the ground, completely still and silent while My Someone called back and forth with the turkeys in the distance gobbling at him. My eyes started to get heavy. “Oh pretty good,” I responded hoping he hadn’t noticed I was asleep. “Oh yeah, with your eyes closed? A couple of hours later, we still hadn’t seen anything. I couldn’t feel my legs …or my rear. I started getting fidgety. iPhone out, I started trying to make a Vine video. Recomposing myself, I waited a little while and gave it a second try. I dropped my gun. Again. “Really babe, REALLY?! ?” he whispered. As you can imagine, the toms of western Kentucky were spared for another day, and while I was unsuccessful in the transition of hunting/iPhone documentation, my counterpart posted this to Vine. Making me realize, that maybe THIS is why we didn’t see any turkeys. Yeah, I know. I look like Sasquatch. Do you have any first hunting stories with your main squeeze? If so, I want to hear them. Till then, happiest of Fridays and merriest of weekends. There was a skunk infestation on their farm. As in, like 8-10 skunks. We’re assuming a breeding pair and then their offspring. For a few months, the farm was a skunk haven. If you went to the farm, you were taking your scent into your own hands. So, we skunk-hunted. A lot. And skunk hunting typically involves sitting in a truck or other inconspicuous place late at night, waiting for those nocturnal jerks to come out at night. Lol that’s a lot of skunks. Our problem has always been opossums. I successfully added quite a few holes to the side of my parents barn in my efforts to cut down the opossum population. HA! Yeah. Growing up we just didn’t have the time or money for hunting. I think if I had experienced it younger, I’d care. And I’m sure if I did it now I’d enjoy it. But, meh. I guess I’ll just hang out in my city lifestyle and tell people stories about romantic skunk hunting. Ahhh, hunting with the loved one. Only happened once for this gal. Deer hunting+sitting on the ground+cold+I was a total wimp. Great post! LOVE this! 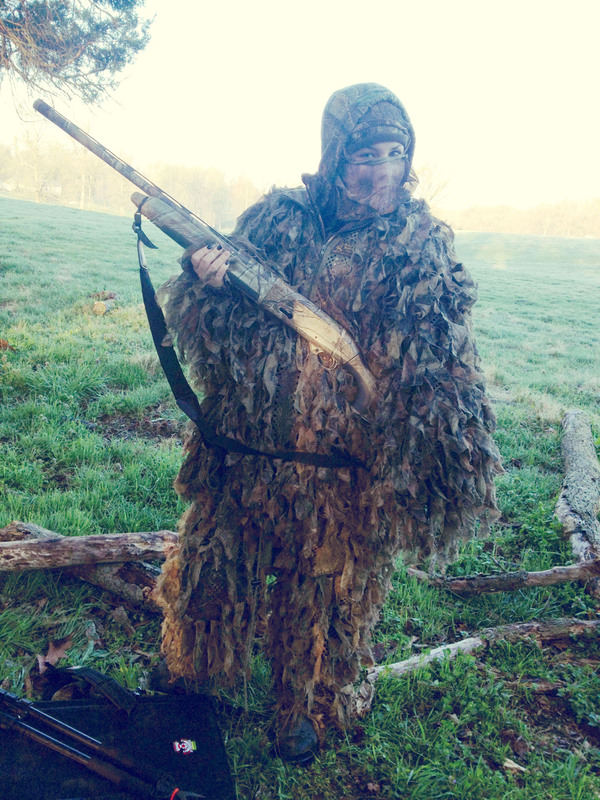 Turkey hunting is such a rush! You’ll get one eventually!! Thanks, I hope so! 🙂 I genuinely enjoy hunting …I’m just a little more like bringing a squirrel along. Sitting still isn’t my specialty. That’s my girl!!! Never a dull moment…..
Oh, I’m right there with ya. I hunted turkey with my Dad a few times in high school and it was so so dull. And that was before we all had fancy smart phones in our pockets. I just ended up shuffling around a lot and whispering to my dad too much. I think all the turkeys in the county knew to steer clear of us. HA! I think there is something about being women that makes it 100 times harder to sit still. Before the wonderful invention that is the iPhone, I was 100 times worse about wiggling (not good for deer and/or turkey hunting). LOL that is a great post. I have not really hunted with my husband of 3.5 years yet. I am the deer hunter between the two of us. I grew up in very lean times and early in life we ate what mom grew/canned in the garden and what dad shot and brought home in the form of wild game. Deer, antelope, ducks, geese rabbits etc. We raised cattle but we didn’t keep any in our freezer because if you kept it you didn’t get to sell it and that was still considered expensive. So I grew up with the mentality you didn’t waste ammo on what you were not going to eat. If you killed it you cleaned it and cooked it. And today I am still this way. So every year I go up on the river to a place I can hunt on and take one or two does (depending on what my permit allows) to put in the freezer. I clean and process the deer myself, so for us to eat deer through the year my cost is 2 30-06 rounds (one shot one kill and if I question if I have a good shot I wait until I know I have a good shot), 3 gallons of fuel roughly, and the cost of my permit. I can feed our family pretty cheaply for that over the course of the year. And it gives me some good quality me time lol. My husband is the guy that brings home the fish though. So I guess it goes good together.